Akkarakkalam Memoirs is an exotic Back water Farmhouse Stay in Alleppey presented as an excellent souvenir of the ancient Akkarakkalam family in Alleppey district with a tradition of 150 years.Akkarakkalm Memoirs is a sprawling 10 acre land with natural flora and fauna, beautifully converted into an ideal tourist destination for the nature lover as well as for the common glob-trotter. 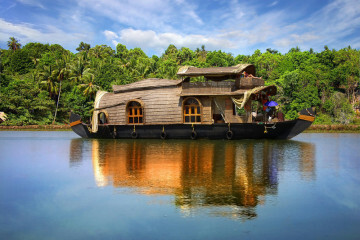 Here you can experience the backwater life at close quarters and inhale the natural scent of pristine countryside. Lodged in the ideal settings of a rustic background, Akkarakkalam Memoirs was handed over to its present 4th generation by a far-sighted visionary K.C. Joseph Akkarakkalam. Akkarakkalam Memoirs presents a grand pastime of fishing for you. It will take you one step closer to the true backwater life. Go fishing and enjoy yourself. Catch them with rods or cast the net and catch them or take aim and pierce a fish with spike. Or if you prefer night fishing, simply go about it and rejoice. Or get into a canoe and row over to the middle of the canal with your fishing line and try your luck. Akkarakkalam Memoirs will remain an indelible memory in your mind. We will take you to churches and temples if you so desire and you can take a tour of the countryside on a bicycle and feast on the immaculate beauty of the place. Rest in the house in solitude or enjoy the quiet evenings when the sun descends in the west. Altogether you get to experience the thrill of a wonderful vacation in a thoroughly different world where you become one with the nature around.